Food safety seems very much on the agenda this week. Without a government-wide performance plan for food safety, Congress, program managers, and other decision makers are hampered in their ability to identify agencies and programs addressing similar missions and to set priorities, allocate resources, and restructure federal efforts, as needed, to achieve long-term goals. Moreover, without a centralized collaborative mechanism—like the FSWG [Food Safety Working Group]—to address food safety, there is no forum for agencies to reach agreement on a set of broad-based food safety goals and objectives that could be articulated in a government-wide performance plan on food safety. are governed by a highly complex system stemming from at least 30 federal laws that are collectively administered by 15 federal agencies. For more than four decades, we have reported on the fragmented federal food safety oversight system, which has caused inconsistent oversight, ineffective coordination, and inefficient use of resources. We added federal oversight of food safety to the High-Risk List in 2007. In recent years, moreover, we have made recommendations aimed at helping to reduce fragmentation in federal food safety oversight. As of November 2018, two of three recommendations related to this high-risk area had not been implemented. In 2017, I wrote about how the GAO has been calling for decades—more than 40 years—for better coordination of food-safety oversight, and my post lists a selection of GAO reports dating back to 1970. The GAO is still at it. We should not give up either. I occasionally write about disease outbreaks caused by food and am especially interested in those caused by romaine lettuce, because it’s so hard to trace back where it came from and how it got contaminated. This post is about two outbreaks of toxic E. coli O157:H7 from Romaine lettuce. Outbreak #1: This one pretty much ended in November 2018. My post on it is here. The CDC’s page on it is here. Food safety lawyer Bill Marler posted a slide show analyzing this outbreak on his website: “Thanks to FOIA, the CDC and FDA, the 2018 E. coli Romaine Outbreak becoming more Transparent.” At least that. The FDA’s web page on this outbreak is here, and the CDC’s is here. Despite finding that E. coli outbreaks spanning years likely came from the same are or farm and was most likely caused by the same factors enumerated above, the FDA only sets forth “recommendations” that growers of leafy greens assess their growing operations for compliance with applicable requirements of the FSMA Produce Safety Rule and GAPs, including (see my snide comments in bold). FDA continues to recommend (suggest, plead, beg, whine) that leafy green growers, buyer/shippers, and retailers be able to trace product back to the specific source in real time and make information about the source, such as harvest date and standardized growing regions, readily available for consumers on either packaging, point of sale signs, or by other means. Voluntary, alas, isn’t good enough. The FDA needs authority to require, demand, insist on. Now. FDA’s final guidance for leafy green growers is here. FDA guidance documents for leafy green growers are posted here. There are lots of them. FDA guidance documents for retailers selling leafy greens are posted here. Pet Food Politics: The Chihuahua in the Coal Mine (2008): a contemporary history of the 2007 recalls resulting from pets dying from melamine poisoning. 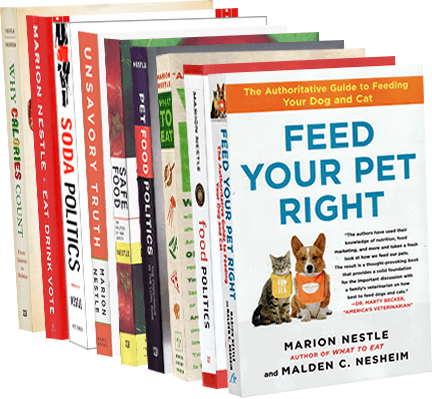 Feed Your Pet Right (2010): an analysis of the pet food industry co-authored with Mal Nesheim. Evangers, a pet food maker occasionally in trouble over ingredient and food safety problems has been caught with horse meat in its products. It says it doesn’t use horse meat, even though it has a license to use it. It blames its beef supplier.Private label pet food brands are selling well. They are cheaper. For the record: all complete-and-balanced pet foods are required to meet the same nutritional standards and to support dog and cat reproduction, growth, and development (they are like infant formula in that regard). Raw pet food continues to raise food safety risks: Rad Cat Raw Diet has been recalled due to Listeria contamination. A case of human Salmonella illness has been linked to a Darwin’s raw pet food. And the FDA announces the recall of Nutrisca dry dog food with levels of vitamin D so excessive that they made dogs sick. Mars Veterinary, the biggest manufacturer of pet foods, is working on some new products made from—get this—lab-grown mouse meat. No, I did not make this up; I got it from Business Insider. Wild Earth, Inc., a biotech pet food startup, sells treats made with lab-cultured protein from the koji fungus, Aspergillus oryzae. The humanification of pet food, says The Atlantic, is nearly complete. Whole Dog Journal asks this burning question: Should you feed ice cream to your dog? (The short answer is no, but this gives me a chance to praise Nancy Kerns’ admirably sensible advice about dog feeding, care, and training). You can see why I love writing about pet food. The FDA is continuing to produce comprehensive, thoughtful reports on such outbreaks and recently issued a report of its environmental investigations. The traceback identified a total of 36 fields on 23 farms in the Yuma growing region as supplying romaine lettuce that was potentially contaminated and consumed during the outbreak. Three of these samples were found to contain E. coli O157:H7 with the same rare genetic fingerprint (by whole genome sequencing) as that which made people sick. These three samples were collected in early June from a 3.5 mile stretch of an irrigation canal near Wellton in Yuma County that delivers water to farms in the local area. FDA considers that the most likely way romaine lettuce became contaminated was from the use of water from this irrigation canal, since the outbreak strain of E. coli O157:H7 was found in the irrigation canal and in no other sampled locations. A large concentrated animal feeding operation (CAFO) is located adjacent to this stretch of the irrigation canal. There are several ways that irrigation canal water may have come in contact with the implicated romaine lettuce including direct application to the crop and/or use of irrigation canal water to dilute crop protection chemicals applied to the lettuce crop, either through aerial or ground-based spray applications. How and when the irrigation canal became contaminated with the outbreak strain is unknown. A large animal feeding operation is nearby but no obvious route for contamination from this facility to the irrigation canal was identified. Other explanations are possible although the EA team found no evidence to support them. assess and mitigate risks related to land uses near or adjacent to growing fields that may contaminate agricultural water or leafy greens crops directly (e.g. nearby cattle operations or dairy farms, manure or composting facility). Contamination of leafy greens with toxic bacteria from animal waste has been a problem for years. Growing vegetables near CAFO’s seems like a particularly bad idea. CAFOs, which produce vast amounts of untreated animal waste should not be located near water sources. Requiring CAFOs to treat animal waste, as human waste is required to be treated, is a necessary first step in producing safe food. Deborah Blum. 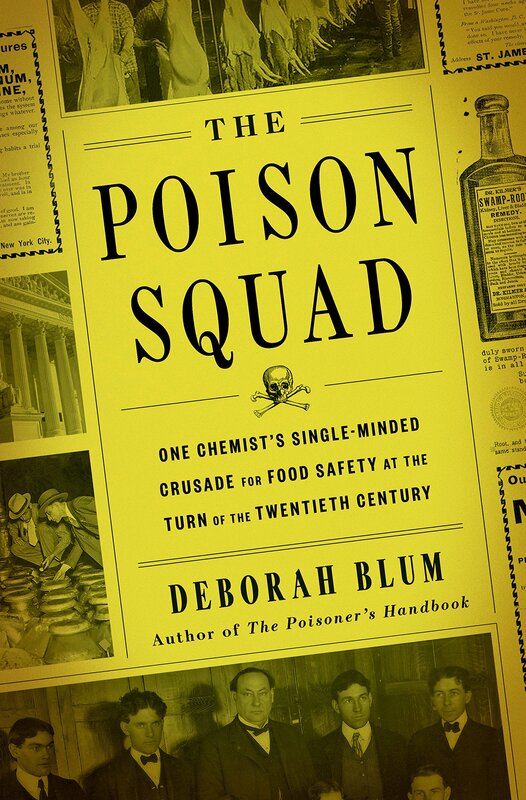 The Poison Squad: One Chemist’s Single-Minded Crusade for Food Safety at the Turn of the Twentieth Century. Penguin Press, 2018. But enough about me. Blum’s book is a clear, wonderfully written account of the political opposition faced by Harvey Washington Wiley, the head of the USDA’s Bureau of Chemistry (later, the FDA) who relentlessly lobbied his bosses, presidents, and the public to insist that food companies produce food safely. If you cannot understand why there are still so many outbreaks of foodborne illness and why so many foods are still having to be recalled, this book is a revelation. Blum, who directs the Knight Science Journalism program at MIT, is terrific at explaining the complex politics that affected Wiley’s work. I particularly appreciated her chapter on the food safety laws passed in 1906. Their passage came about, in part, as a result of Upton Sinclair’s publication of The Jungle, a book that exposed the horribly unsanitary and dangerous conditions of the Chicago stockyards. Try to imagine something like this happening today: the book came out early in January. By July, Congress had passed food safety laws. Blum’s chapter explains how that happened. Those events were news to me. Much else in the book will also be news, even to people who follow food safety issues closely—the intensity of the opposition to everything that Wiley was trying to do. We need leadership like that today. I wrote about the recall of Honey Smacks cereals last June when its Salmonella outbreak was just past its peak, but a post from food-safety lawyer Bill Marler made me think this outbreak is worth another look. The CDC says the Honey Smacks outbreak is over now. But it also says you should still be careful not to eat Honey Smacks with a “best if used by” date of June 14, 2019 or earlier (the packages I saw on the shelf at the Ithaca Wegmans were dated May 19, 2019—oops). Marler got my attention by pointing out what the FDA found in its June 2018 investigation and reported in its warning letter to Kerry, Inc, the manufacturer of this Kellogg’s cereal. Between September 29, 2016 and May 16, 2018, you repeatedly found Salmonella throughout your facility, including in cereal production rooms. During this time period, you had 81 positive Salmonella environmental samples and 32 positive Salmonella vector samples (samples taken in response to finding a positive on routine testing)…Further, you had repeated findings of other Salmonella species in some production lines and rooms used for the manufacture of cereal. What? Over a period of a year and a half, the manufacturer’s testing identified 113 samples positive for Salmonella—and did little or nothing to prevent Salmonella from getting into the cereal? The damage was hardly trivial. The Food Safety and Modernization Act set rules governing the safe production of foods. Clearly, some companies, this one apparently, did not bother to follow them. This, then, is a matter of inadequate enforcement. Do food companies need to be forced to follow standard food safety procedures? Apparently so if public health is to be protected. In April, I wrote about the deadly outbreak of Listeria-contaminated processed meat (“polony”) in South Africa. Back then, the country’s Health Department explained what it was doing to try to stop the outbreak. It’s now pretty much over, and the Health Department has issued an updated report on it. Listeria is deadly. For this outbreak, the death rate is 27% (216 of 806 cases in which the outcome is known). As is typical of foodborne disease outbreaks, most cases occurred long before the products were recalled. 38/65 (58%) of ill people or their proxy reported consuming polony prior to their illness onset; brands manufactured by Enterprise Foods were most commonly reported to have been consumed where brand of polony was known. There are challenges regarding the turn-around time of testing of environmental swabs from facility inspections. Challenges are arising on account of the volume of specimens received during the last three weeks, machine failure and in some cases, challenges regarding test result interpretation. Each challenge is being addressed through appropriate interventions. Stop making the implicated product and recall the ones at risk. Do not blame your customers. Reach out to customers who have been harmed. Teach what you have learned. Marler has put money behind this advice. Let’s hope the CEO takes him up on it. The CDC has issued its counts for the extent and cause of illnesses and deaths caused by eating contaminated food for the years 2009-2015. For starters, outbreaks of foodborne illness increased during this period. Every US state and territory reported at least one outbreak. Listeria, Salmonella, and Shiga toxin-producing Escherichia coli (STEC) accounted for 82% of all reported hospitalizations and 82% of the deaths. Foodborne illnesses remain a serious public health problem, not least because it is so difficult to trace illnesses back to a specific source. The contaminated food could only be identified in about one-fifth of total outbreaks. Although foods of animal origin were leading carriers of illness, plant foods are also at risk. All of these illnesses are preventable. We have laws requiring food producers and handlers to follow food safety procedures. When they do, the risk of foodborne illness is greatly diminished. These procedures were designed originally to prevent astronauts from getting sick in outer space under conditions of zero gravity (you don’t even want to think about the consequences of foodborne illness in a space capsule). If the methods worse in outer space, they ought to work on earth—but only if they are designed and used appropriately. These data argue for stronger food safety regulation.